Are you looking for a fun activity to do with your child? A bean tepee is a magical place you can create easily for your children–and they can help make it! Then water the plants together during the next weeks and watch the tepee grow green and sprout tasty snacks. It will become a special hideaway for your child and a great way to get them excited about playing outside and interested in growing and tasting food from the garden. Line up four or more long poles together on the ground. About a foot from the top end, wrap them together with the cotton rope or clothesline. After looping the rope two or three times, tie it loosely (your hand should be able to slip into the loop). Use another section of cord to loop around the first cord between each pole, weaving in and around each pole until the first cord is taut. Add 8–16 vertical jute lines and tie them to the top of the structure while it is still on the ground. These will be the lines between each of the legs. Stand up poles, splay out the legs, and position them to make a circle about 4 feet in diameter. Dig small, deep (12-inch) holes for each leg pole. Put each leg into a hole then fill it about half-full with dirt and tamp down as you would when sinking a fence post. Repeat until the holes are full and legs are solid in the ground. Spread out the vertical lines so that they are evenly spaced around the tepee. Tie a horizontal piece of twine around each leg pole about a foot above the ground, attach the vertical twine to the horizontal twine. Don’t forget to leave an opening between two of the legs for your door! Add two or three more horizontal rows of twine, spaced two feet apart, and going as high as is comfortable to reach. These horizontal lines will keep the plants from draping into the center. Plant bean seeds on the outside perimeter around and between each pole leg and watch them grow into a shady fort perfect for hot August days. Send Your Kids to Summer Youth Farm Camp! If you have a child that’s 7-11 years old, sign-up for Summer Youth Farm Camps at 21 Acres in July! 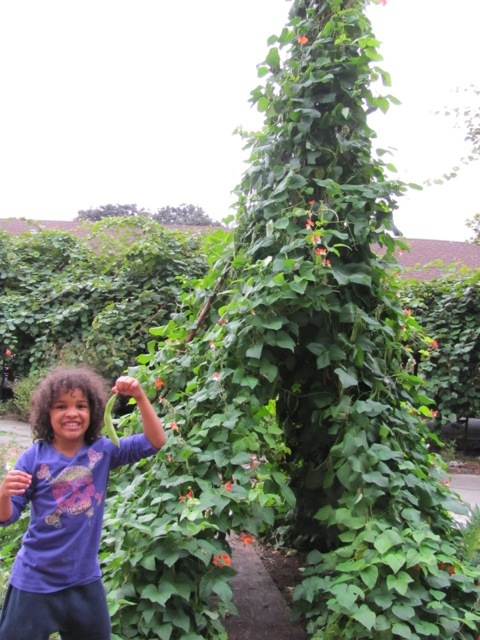 Campers can explore the bean tepee and all aspects of the beautiful 21 Acres organic farm and education center. Days are full of hummingbirds, worms and sunshine, while we learn about plants, taste delicious foods straight from the farm, sing, play games, make crafts and explore. The connections, friendships, experiences and confidence that our students build throughout a week at camp provide a foundation for healthy minds and bodies and a lasting relationship with nature.